New Mangalore Stores in JP Nagar sells mini samosas that sell out in two hours! A good samosa has yummy filling with crunchy yet slightly flaky crust, a great samosa has a perfect crust to filling ratio, an awesome samosa is fresh, and doesn’t require America to come grant it freedom (if you catch our drift). The best kind of samosa is all of the above, and the New Mangalore stores in JP Nagar 7th Phase has their own fast-selling supply of it. The store stocks the usual fare found in all Mangalore Stores (snacks, condiments, masalas, brown rice, pre-mixes), but the samosas are the hottest selling item, as it sells out everyday within two hours of arriving! 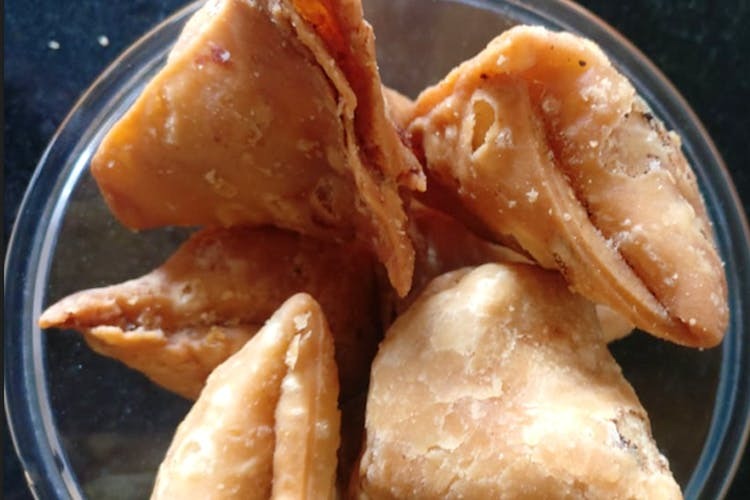 Unlike the samosas other places that source or make them, these bite sized ones are neither oily, nor lack (or have an excess) the potato stuffing that we all love. Much smaller than regular samosas, the stuffing is substantial, yet not too spicy or heavy, and manages to be delicious despite not having any onion and garlic (don't knock it till you try it!). The store only sells the one kind of samosa, and restocks the next day once they sell out, so make your way there before 2pm if you really want to try it. At INR 45 for 10 pieces, it’s a steal! If you’re out of luck once you get there, you can pick up some chakklis, sweets, or some Mangalore Buns that are just as good. Take your own box/container to pick up the samosas, as opposed to the small plastic bag that squishes them out of shape.